Vultures are a critical part of ecosystems across the world, acting as the primary cleanup crew for the dead. New research suggests that if vultures weren’t here to do what they do best, the whole recycling side of the Circle of Life could grind to a halt, because other scavengers just don’t fill their feathered shoes. This is concerning, because vultures as a group aren’t in great shape. Their numbers have declined precipitously across the world. In Africa, nearly two-thirds of all vultures have vanished in the last few decades. The birds are being overharvested and poached, or they’re dying after consuming poison intended for predators of livestock. In Europe, use of a veterinary drug previously responsible for near-extinction of a vulture species in India now threatens thousands of vultures. The rapid decline of vultures is especially alarming when considering the potential ecological chaos from losing nature’s guild of undertakers. What happens to the dead when vultures aren’t around to do their thing? It’s a question that wildlife ecologists from Mississippi State University, the University of Georgia, and the USDA’s National Wildlife Research Center wanted answers to. The researchers ran an experiment where they kept vultures from scavenging carcasses to see if other types of scavengers stepped up their game. 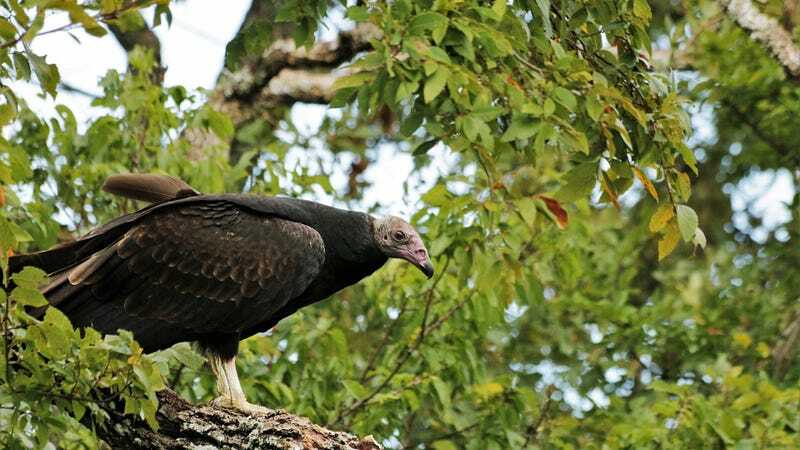 The team used sixty sites on a forested plot of land in South Carolina to run 130 week-long trials, half with vultures excluded from feeding on the carcasses, and half as controls with vultures present. Each trial consisted of a dead rabbit pinned to the ground, with motion-activated cameras set up to snap photos. To exclude vultures, plastic crates were placed over the rabbits during the day, but removed at night since vultures are day-active, and mammalian scavengers, like coyotes and opossums, tend to be nocturnal. The researchers recorded what animals visited the rabbits and when, and how much of the rabbits were eaten. Their results, published last week in the journal Ecology and Evolution, paint an unsettling picture of a vulture-free landscape: Mammalian scavengers didn’t meet the extra demand. When vultures are excluded, carcasses remain more intact for longer. By the end of the week-long trials, there were ten times more fully-scavenged rabbits in the controls than when vultures were kept away. There are a few reasons why mammals may not be great vulture substitutes. Vultures can fly, locating carcasses quickly. Indeed, in this study, vultures arrived at the sites days before mammals did. Slow to show mammals get there later in decomposition, when the body may be too putrid to eat—something vultures have very few issues with. There are some key limitations to the study, the authors note. For one, it took place in a single region of the world, and other places may have larger populations of mammalian scavengers. Also, even though the rabbit carcasses at the experimental sites weren’t available to vultures, the vultures could still clean up other corpses in the surrounding countryside; if vultures truly vanished, there’d be far more carcasses in the ecosystem, which might be overwhelming enough to cause mammalian predators to scavenge more than they would normally. Finally, the season might influence how effective vulture replacements can be. The study occurred during the swampy, oppressive heat of the Carolina summer, which boosts bacterial decomposition and makes carcasses unpalatable to mammals even faster. The warmer months are also bountiful with other menu options, approximately all of which are more appetizing than Peter Cottontail’s rotting remains. But even if mammals more effectively scavenge in the winter, the summertime piles of carcasses attracting insects could be a major problem for local ecosystems and people alike. Without vultures to run cleanup, disease-carrying flies could easily swell in abundance on the plentiful flesh, increasing infection risk in nearby human communities. The study’s findings are a reminder that biodiversity loss is more than just the ticking down of an arbitrary number. Decline and extinction can abruptly destroy key animal “industries” that keep everything running smoothly. Ensuring vulture populations are healthy is even more important in light of the realization that there may be no ecological second string in wait.